A selection of photographs taken of the second Family Day event, organised by the Northmoor Trust, at Thrupp Lake. 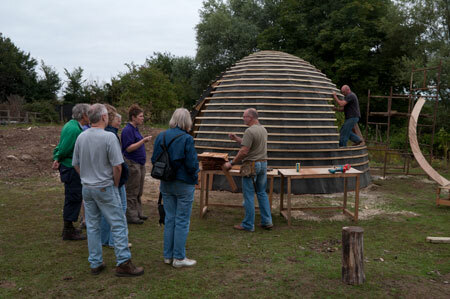 The second community family event at Thrupp Lake organised by the Northmoor Trust brought together the regular volunteer workforce and local families in a community event to help build a shelter on the shore of Thrupp lake. 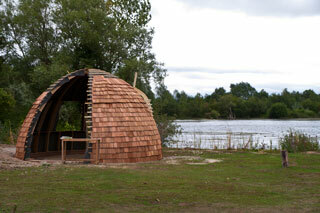 It is hoped the shelter will provide a place for people to sit and enjoy the lake in any weather. 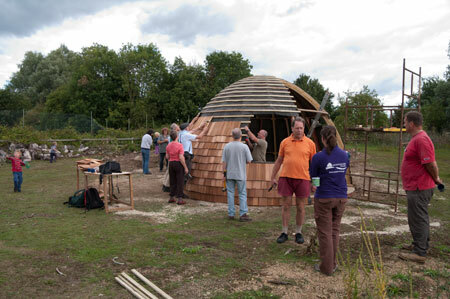 Thursday 18 August was another fine day, and a large number of people turned up to make their contribution to the construction of the shelter, an original and unique design that, we are told, will take the form of a lily. 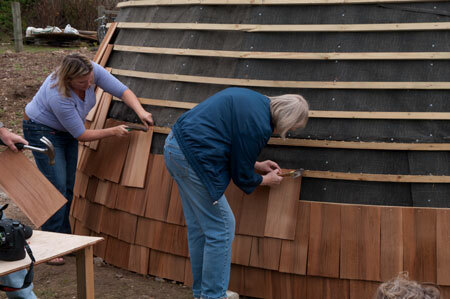 The main effort of the day was directed at attaching hundreds of cedar wood shingles to the wooden frame, which had been erected during the previous weeks, – a sufficiently undemanding task for just about everyone who came to be able to contribute to. 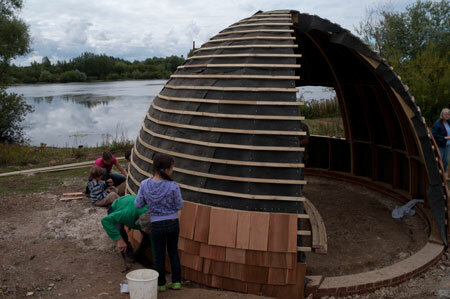 By the end of the day the roof was complete up to a level reachable by people on the ground. Refreshments were provided courtesy of the Northmoor Trust, and, despite it being essentially a work event, it was an very much an enjoyable, rather than arduous, occasion for all who came. 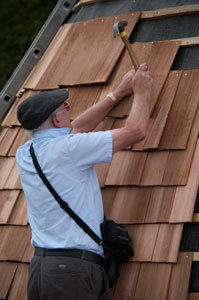 – to attach a large pile of cedar wood shingles to the already constructed frame. And then it was down to work. 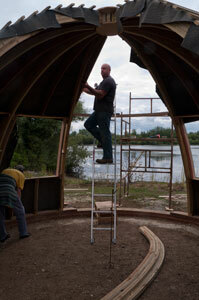 while inside, construction of the front canopy was beginning. 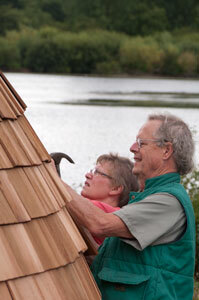 Many hands made light work of attaching the many roof shingles. 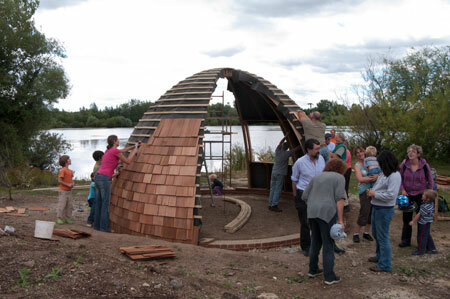 The shelter is an example of what is known as “green build” which makes use of sustainably-sourced materials and low-impact construction methods to create a naturalistic design sympathetic to its surroundings. 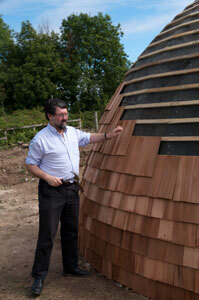 The result of these efforts – an emerging copper-coloured bud glowing in the weak sunshine. The colour, while attractive for now, is only temporary. 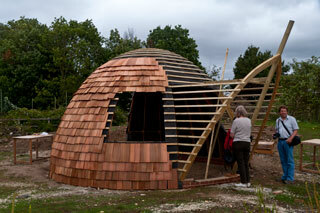 The unfinished cedar wood will soon weather and darken, and the structure will eventually merge into the landscape. 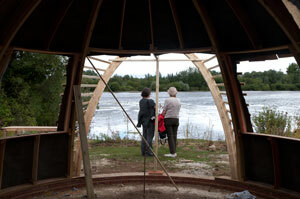 The view across the lake from inside the shelter. Over the next few months, the Northmoor Trust will be carrying out work to improve access to the site, and replacing the fences and metal gate around some parts of the lakes. Other plans include establishing a circular walking route around the lake, and building an environmentally friendly visitors’ centre. 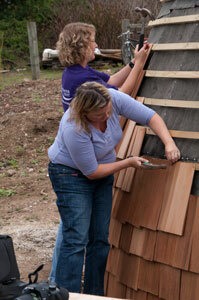 Further events are planned over the coming weeks and months to assist with these tasks. Please watch the events information on this website for updates about these. For more information please visit the appropriate links below.